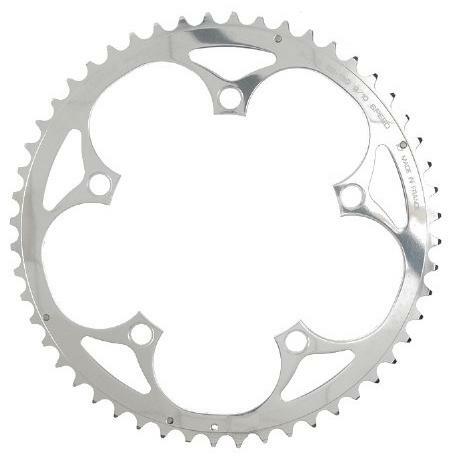 We stock a wide range of chainrings for modern and older crank sets. Outer two rings are 110 mm, inner ring is 74 mm. 33 tooth T.A. Zephyr (Silver) inner/middle Rare Size! T.A. 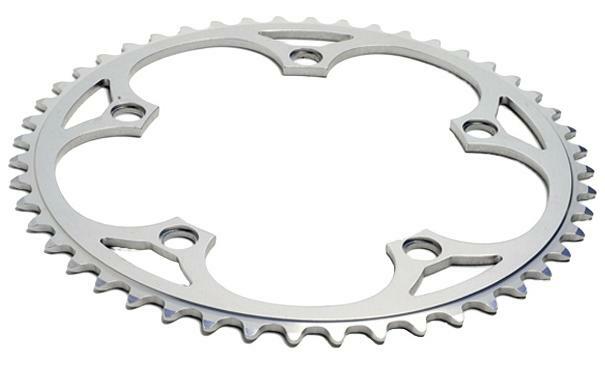 chainrings are super-high quality, premium rings in Zircal 7075 aluminum. They have machined teeth, and a mirror-like finish. 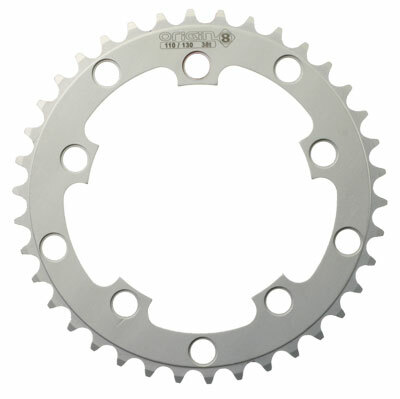 These U.S. made 6061 T6 chainrings (formerly Rocket Rings) are a great value, and ideal for use for fixed-gear road conversions. They are thicker and stiffer than most road rings, but they work with either wide or narrow chain. Double set of mounting holes means they fit either 110 mm or 130 mm bolt circle cranks! They have tall teeth to prevent accidental derailment, and are a great choice for singlespeed or fixed-gear bikes. They are not recommended for double or triple cranks. There is a lot of confusion about the compatibility of narrow 9-speed and 10-speed chains with older cranksets. Shimano says you should replace the inner chainring(s) with specially designated 9-speed ones, but then they're all too eager to sell you stuff, whether you need it or not. Shimano is also concerned about clueless users. The worst-case scenario is that you will be riding along with the bike in its highest gear (large front, small rear) and then for some bizarre reason shift down in front before downshifting in the back. (There is no shift pattern in which it is reasonable to shift in this sequence.) If you do shift this way, there's a small chance that the chain might "skate" over the edges of the teeth for maybe half a turn. In practice this "problem" almost never materializes. Many, many cyclists are using 9- or 10-speed chains with older cranksets and having no problems whatever.